Total supply–dry gas production plus net imports–has been declining since October 2015* because gas production is flat, imports are decreasing and exports are increasing. 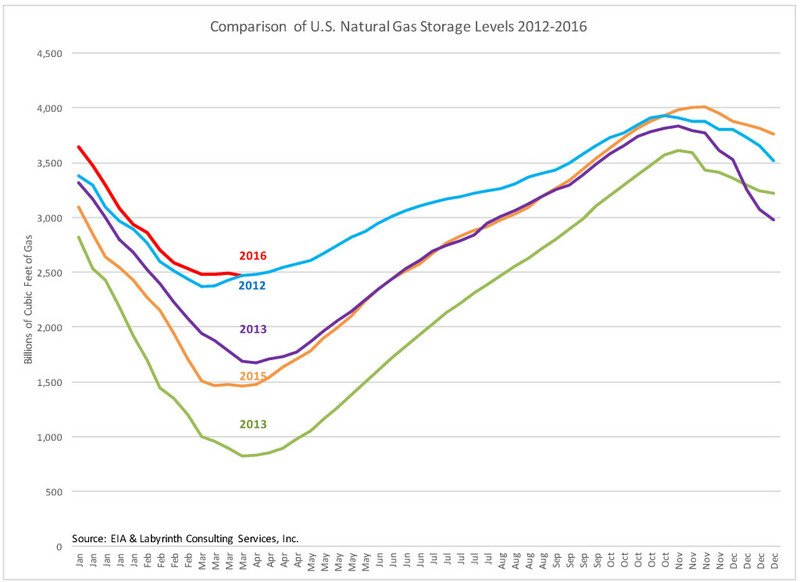 Shale gas production has stopped growing and conventional gas has been declining for the past 15 years. 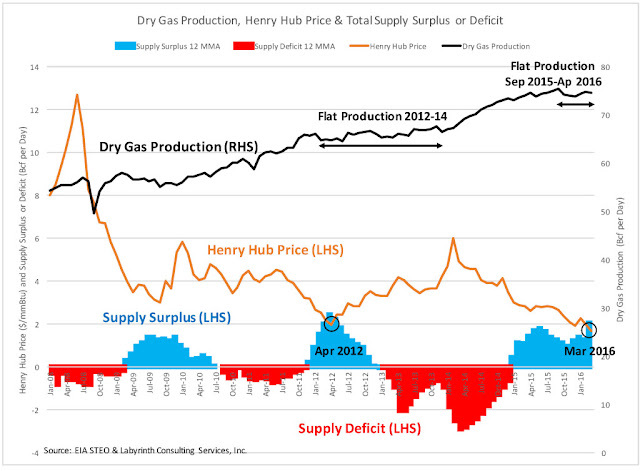 As a result, the supply surplus that has existed since December 2014 is disappearing and will move into deficit by November 2016 according to data in the EIA March STEO (Short Term Energy Outlook) . 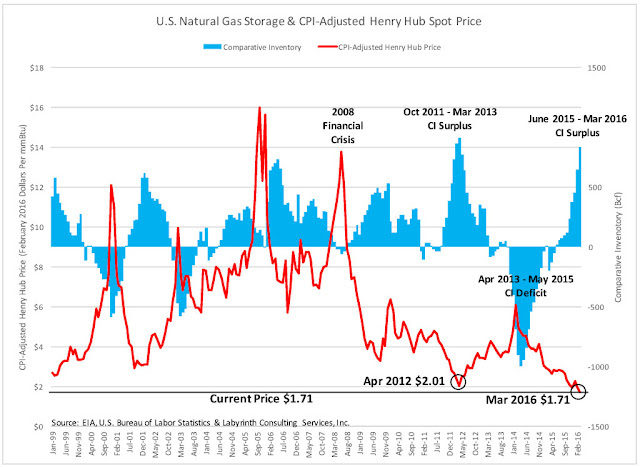 During the last supply deficit from December 2012 to November 2014, Henry Hub spot prices averaged $4.05 per mmBtu. Prices averaged $1.99 per mmBtu in the first quarter of 2016 so it is reasonable that prices may double during the next period of deficit. There are currently on 92 rigs drilling for gas. 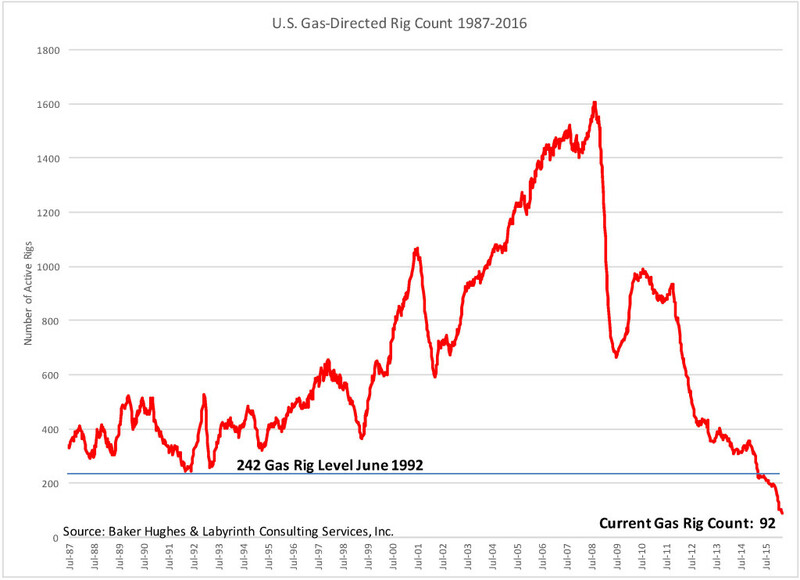 That is 150 rigs less than the previous record-low set in 1992 (Figure 2). Production cannot be maintained at this level despite unrealistic faith in drilling efficiency and spare capacity from uncompleted wells. EIA forecasts $3.20 gas prices in January and February 2016, and $3.41 in December 2017. My forecast based on comparative inventories is about 15% higher overall than EIA’s but peak prices are 20-30% higher. It calls for winter prices in the $4-range for 2016 and 2017. 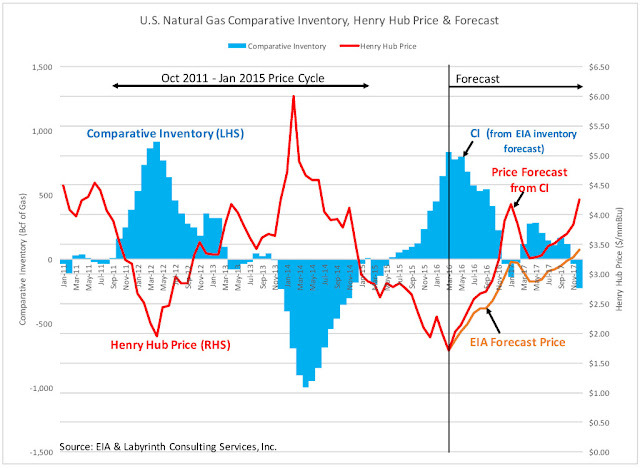 A doubling of gas prices to $4.00 per mmBtu may seem overly optimistic based on current price levels that have averaged about $2.00 since the beginning of 2016. Yet average prices since 1976 are $4.61 in 2016 dollars and the modal value for that period is $3.50 (Figure 7). Figure 7. CPI-adjusted Henry Hub price and forecast (February 2016 dollars per mmBtu. Source: EIA, U.S. Bureau of Labor Statistics and Labyrinth Consulting Services, Inc. Moreover, the average price since January 2009 is $3.80 (2016 dollars) and the long-term trend-line is above $5.00 per mmBtu. 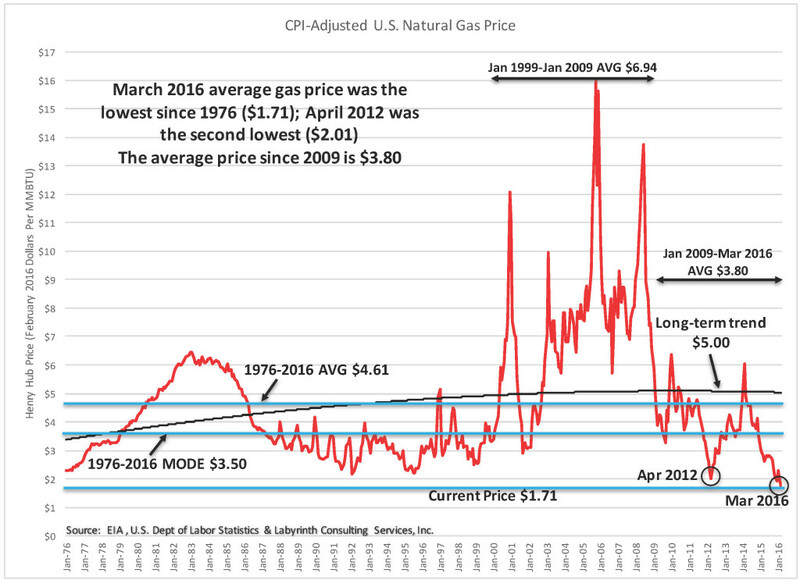 All the data presented in this analysis suggests that present prices represent the low point in a price cycle similar to 2012-2014 in which $2 gas was the low point in an overall cycle whose average price was $3.65. That price is consistent with average prices since 2009 and the long-term modal price. The average of 2012-2014 peak prices (November 2013-December 2014 period negative comparative inventory–Figure 6) was $4.34 per mmBtu. My forecast for gas prices to average $3.65 in 2017 (Figure 6) is quite conservative. 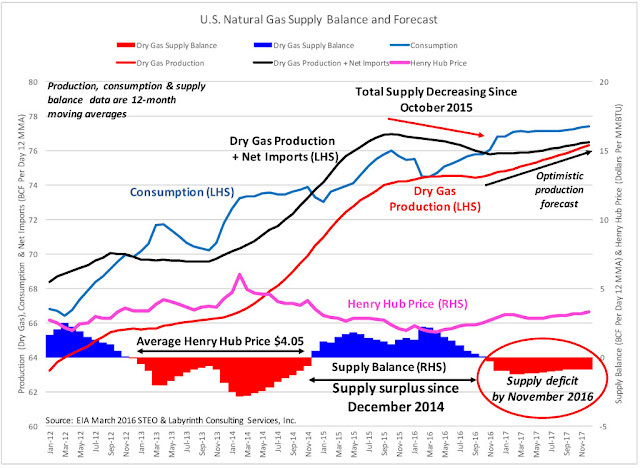 It is based on the dubious EIA assumption that producers will quickly respond to a an increase in gas prices to about $2.35 per mmBtu (their forecast price) and that production will increase strongly throughout the rest of 2016 and 2017. 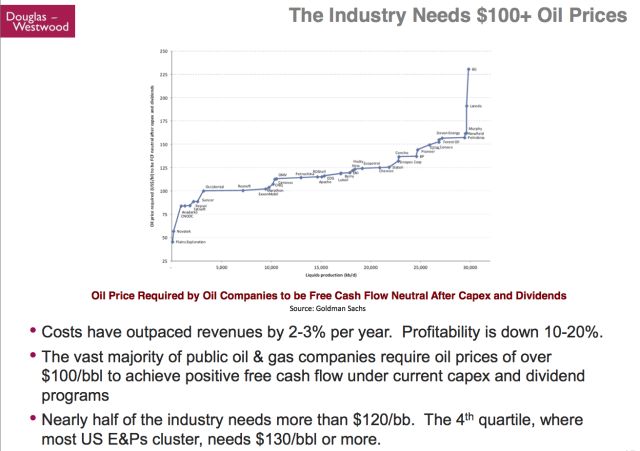 That is what happened in early 2014 (Figure 5) but then, gas prices were more than $6 and external capital was readily available before the oil-price collapse that began later that year. 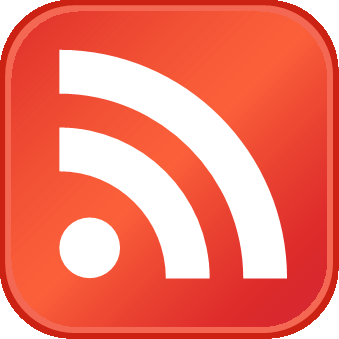 Although capitalis still available, companies are more likely use it to pay down debt than to resume drilling especially for gas at least for the rest of 2016 and possibly longer. The days of pure gas players are pretty much over and liquids are a more attractive drilling target at any price than natural gas. Having said that, the best operators (Cabot, EQT and Chesapeake) in the Marcellus Shale play need $3.50 to $4.00 gas prices to break even and most need $4.25 to $5.50. In the Utica and Woodford plays, most operators need at least $5.00 to $6.00 prices to break even. 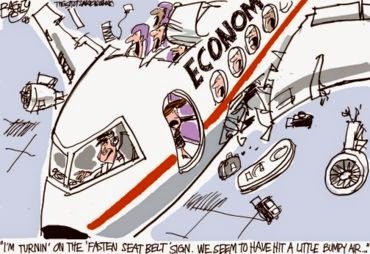 That is why it is probably conservative to suggest that gas prices will double in the next year or so.